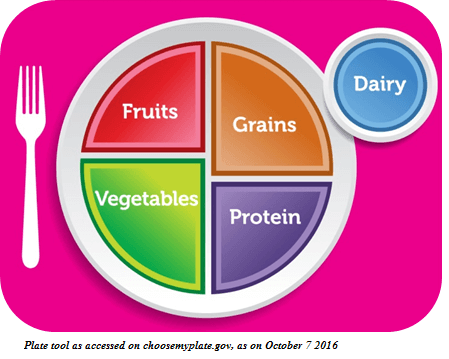 A balanced diet must contain sufficient amount of carbohydrate, protein, fat, vitamins, minerals and fibre in the required amounts*,1. Each of these nutrients has a vital role in the all-round growth and development of children1,2. Carbohydrate: Provides a source of energy. In a child’s active life style, carbohydrates are a vital source of energy to keep them active 1-3 . Protein: Required for growth and repair. In years of rapid growth, children need proteins in adequate amounts for optimal growth 1,3 . Fat: It is a source of energy and are required for absorption of fat soluble vitamins 1,4 . Vitamins: Required in very small quantities to keep your child healthy 1 . Minerals: Required for healthy teeth, bones and muscles. Significant development of teeth, bones and muscles happens by 10 years of age 1 . Fibre: Helps maintain a good intestinal function. Fibre is not digestible and helps in bowel movement 5,6 . *A balanced diet is the presence of these nutrients in the right proportions1. World Health Organisation. Healthy Diet Fact Sheet No. 394. September 2016. http://www.who.int/elena/healthy_diet_fact_sheet_394.pdf. Accessed October 7, 2016. Anderson JW, Baird P, Davis RH, et al. Health benefits of dietary fiber. Nutrition Reviews. 2009;67(4):188-205. doi:10.1111/j.1753-4887.2009.00189.x.